Genuine Fender® Standard Strat® tremolo bridge assembly. Vintage style 6 screw mounting system. Chrome top plate and 'FENDER' stamped bent steel vintage style saddles. Saddle string spacing width 2-1/16". "Big Block" cast tremolo block height 1.644", width 2.884", thickness 0.571".. Fits Fender® Strat's with 2-1/16" (2.065") mounting spacing. Accepts metric 5mm tremolo arm (not included). This is a right handed bridge assembly. 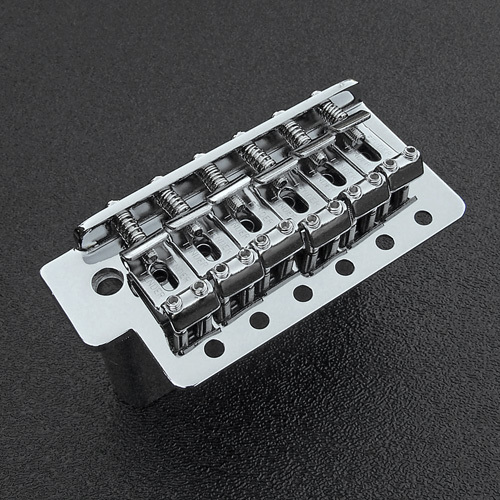 Fender® states this bridge accepts a 10-32 tremolo arm which is incorrect, we have determined conclusively that this bridge accepts the metric 5mm tremolo arm. Every screw on this bridge is metric; the saddle height adjustment set screws are 3mm (M3 x 0.5). intonation screws are 3mm (M3 x 0.5) and the top plate mounting screws are 4mm (M4 x 0.7), This bridge is made in Taiwan by Ping. Tremolo block and top plate are both stamped PW-29. Be sure to measure your mounting spacing and string spacing before ordering. Does NOT include mounting screws, springs, claw or tremolo arm. Ships as depicted in photograph on the right. Not compatible with any thin bodied (1-1/2") Squier Strat®.